It was a day filled with misconceptions about RA, and it really bothered me; but I didn’t figure out why until this morning. I hate being misunderstood and when it’s about RA, it bothers me more because I feel like I’m judged as a failure, a bad mother, an un-giving person, lazy, or dishonest. Just once, it can make me feel like I got kicked in the gut. Yesterday, I had that experience repeatedly. Katie Beth and I were discussing a brief encounter with a doctor and we started laughing about how great it could be if I could put the truth of all of this into the book called it Is That Your Final Answer? Then we started laughing about how some game show lines fit life with RA. Laughing always helps. But the day was much longer, and in the evening, I was finally at home in bed with a sheet over my head, in too much emotional pain to write and too much physical pain to do anything else. Do you ever have these encounters where you know someone completely misunderstands? Do you just let it go unanswered, for whatever reason? I’m trying to come up with answers I could have used that day – unspoken answers to misconceptions? Vignette 1: Is that your final answer? Vignette 3: Let’s make a deal! I don’t know; I’m just doing my best and assuming the same of everyone else with RA. We really need someone to give us the benefit of the doubt. How about you? Any UNSPOKEN ANSWERS to misconceptions? I am not sure what put you into this questioning mode…questioning yourself. Please don’t do this to yourself. After 13 years of traveling my ra journey the only sure thing I have now is my belief in myself and my ability to push on through regardless of what others will say or do to me. And this is both in my personal world and in the medical world. It did take me along time to get to this point but please don’t doubt yourself. This is your life, your body and you know it best. As much as the medical world wants to believe they have all the answers they don’t. That is apparent as research still ensues (Thank God) for all the new discoveries still out there for people like us. I love the parallel you made in this blog but at the same time it attests to a still sad state of affairs if a patient is forced to feel this way at all. Hang in their Kelly and know that you know your body the best. It can be so difficult when we feel so bad to be so strong but strong we must continue to be if we are to keep traveling this journey at all. Thanks for these words, “…please don’t doubt yourself. This is your life, your body and you know it best.” I really needed to hear them. I seem to have a propensity to doubt myself and feel like I have to “prove” that I’m not lazy by doing things that hurt me. Thanks so much. I’ve stumbled upon your website and I have really enjoyed reading your blogs. I just finished reading “Is that your final answer”. I developed JRA when I was 6 months, I had all these experiences when I was just a kid, although they weren’t with medical professionals they were with my classmates and teachers. One remark I got was “kids don’t get Arthritis”. My father had a nice chat with the principal the next day. Please don’t refrain from telling people what you think. Their eyes need to be opened, people need to be educated and to just plain get their heads out of their asses. Medical professionals should know better. Please keep writing your blogs, I enjoy reading them and can definately relate. Kelly I really don’t know what my final answer is but if we could only shock or recreate the pain that we endure for five minutes in each doctor, nurse or friend…I bet we would have at least some sympathy and possibly better pain management. Breaking my ankle recently shows that having a visible sign “cast” gets a whole lot more sympathy and casseroles than a life sentence of RA pain and destruction. I hope your ankle is healing well. Yes, most of us have had “traditional” injury to compare the whole experience with – it’s like they don’t realize that either. I am a very outspoken person so people will usually only say something dumb once and then realize they don’t like my outspoken response so they will lean on the side of caution in future conversations. I’m not rude, just to the point and honest. I tell it like it is and don’t allow them to assume that I can do what person A or B can do. We are all individuals and RA affects us all differently. Just because person A can run a mile with RA doesn’t mean I am lazy when I can’t walk around the block. I NEVER let me doctor run over me and we have developed both a good relationship and mutual respect. We all need to speak up and help others understand rather than to allow their ignorace. I love your line: “I found out I can’t because I tried, and I can’t”. To add to that how about “Maybe tomorrow, maybe next week. I’ll get back to you. In the mean time stop judging me for things you’re too bull headed to understand.” But maybe we need to be more understanding towards those who don’t know or WON’T know. A standard answer may be “I’m sorry for your (insert relationship here), but since you are unaware that RA is different for everyone, please tell your (insert relationship here) to keep trying/be grateful. To Kelly and all my Warriors…I read with interest Is that your final answer…I could not help but laugh after the horrific hospital experience I have just been through. Susan, what a terrible experience! It’s hard to decide which part of the story is most outrageous, but I think I vote for the nurse who wanted you to investigate why your body was fighting itself. (I’m a nurse and always want nurses to be both smart and caring). Thanks for telling the story with a touch of humor. Susan, that story is just horrific and you handled it so well kicking that nurse to the curb. STOP CHECKING? REALLY? LOL. It’s so frightening, it’s laughable. How are these people able to keep working? Bless your heart, Susan. That very well may be the worst situation I’ve ever heard!! I’m absolutely horrified! Do you mind sharing what state you live in so that I can avoid at all cost?? I hope you’re getting proper treatment now! Hugs to you! Hi Kelly, great post as ever. One of my unspoken answers is when someone I’ve not seen for a while says to me ‘You’re looking really well’, ok that’s a compliment, I do always make an effort to be nicely made up, but I have come very very close to saying ‘Yes its amazing what make-up can achieve’. I just get the feeling that just because you look ‘well’ some people expect us to suddenly be ‘normal’ again. Another is when I’m told I’m being very quiet (hubby will sometimes say this), & I feel like saying ‘That’s because I cried myself to sleep with the pain and then woke up several times during the night’ Or I might just be having a really bad day, during which I tend to curl into myself. Maybe we should just start telling it how it is, maybe then people, even sometimes those closest to us, would start to really understand. Haaa! The RA Shuffle…in search of intelligence! ROFL! Love it! tyvm Susan. It just helps me cope & get out my frustration in as healthy a way possible. I’m so glad others can relate. Just sorry it takes pain. Kelly and all of my fellow RA Warriors. I know Ra is not laughing matter but along with my regular prescriptions, I also take a dose of humor daily. I do not care if a strain a tummy muscle or not, the endorphin rush is completely worth it!! Susan if I could have been there in the hospital with you, we could have laughed together while preforming the RA shuffle in search for intelligence!! If ignorance could be bottled I bet someone would label it a cure for RA!!! LOVE, LOVE, LOVE, this post!!! In my short time with RA I’ve already found out that people don’t really want to know about the pain. It is easier for them if you just stay silent and pretend it isn’t there. But is this really healthy? I don’t know. Jane, I’ve come to the conclusion that when confronted by a disease that can’t be cured, that can happen to literally anyone with no known cause, it’s human nature for people to back away from it. It frightens them. The flight response kicks in, and they either ignore you or say unintentionally stupid things to minimize your suffering. I was cheering as I was reading this because you hit the nail on the head. My RA began & still thrives in my shoulders & hips. Don’t get me wrong, every joint in my body hurts every day, but hips & shoulders were the first culprits. People see me knitting or doing crotchet & wonder: how can you do that with RA? well some weeks & months I can’t. Some days it is the only physical activity I can do. Because I can’t lift my arms, stand or walk. Because my shoulders feel & sound like bone grinding on bone. Because my hips are so swollen I am losing circulation below the waist. Because sometimes the pain is so intense when I stand up that I fall over. If anyone even puts a finger on my legs i feel it in my hip. So yes I knit & crotchet. It doesn’t mean that I don’t have RA. it doesn’t mean I’m not in pain. It doesn’t mean I don’t need help getting dressed most days. Some days are better some days are worse but what always makes my day worse is being doubted & negatively judged. I also deal with family that still to this day don’t understand RA. They still refer to it as plain ole arthritis. I don’t know how many times I’ve had to explain RA is not actually arthritis it was misnamed because it’s actually an auto-imune disease. And those days where I get comments about well why can’t you do this, you did it yesterday just fine…..well duhhh yesterday my hands weren’t swollen and hurting but they are today. Thank you so much for this post! As I was reading it, I thought that I’ve heard those exact things myself. I had a doctor tell me the only way I was going to get better was to exercise at least an hour a day. I asked him “How can I do that, when there are days I can’t even walk?” His response, “Well, you’re going to have to find a way.” I thought to myself “Okay, I’ll just hop right up and start exercising, and then you can meet me at the ER when I’ve literally fallen and can’t get up!” I just don’t understand how intelligent people who have become doctors can be so naive about how someone with this illness feels. Hello Kelly, can I just say, I was diagnosed with RA last year. I had no understanding or comprehension of what it was and played it down, not realising what a life changing disease it was until I lost my job and the hobby work I did. At the time I was not able to express myself to the medical profession or authority, until I stumbled across your website that is by “accident” and thanks to you, I found my voice. The medical team I have here in the UK are great,other departments I have had to deal with have caused me such emotional pain and stress, as I felt like I was being judged and not believed. Then, a few weeks ago, I found my unspoken answer and I spoke my truth from my heart to the person that needed to hear it. I told them that “I am having to deal with able bodied ignorant people who have no understanding of chronic illness and rheumatoid arthritis. I don’t need to forgive the way I have been treated, I need to forgive the poor mis-guided souls that have not woken up yet to realise that they are contributing to the suffering of humanity through their own words, deeds and actions”. My final answer Kelly is this. I no longer need to judge and keep beating myself up due to other peoples misconceptions and what they may be thinking about me and with the greatest of respect, neither do you. You have helped and enabled so many living with RA to understand the disease and you are a shining, guiding light to those in the darkness. What a wonderful gift you are giving to the world and what a wonderful gift you are too. Please stop doubting yourself, your light is needed, your love is needed, to bring the changes we want to see in the world. I hurt every day. I hurt a LOT every day. I hurt ALL day. Because I have learned not to grimace, scream, or pass out- does NOT mean that I am not in pain! Because I can still do some things on some days does not mean that I am not in pain. Because I get angry and frustrated and occasionally push myself beyond my limits does not mean that I have been miraculously cured. If you do not have RA and the other 6 diseases that I have been diagnosed with, do not even think about telling me how I should or do feel and what I should or shouldn’t feel. That includes YOU DOCTOR!!!!!!!! Yeah, Phyllis! You tell ’em! I may use your words (mixed with a few choice words of my own) in the future – thank you for them! What a wonderful answer. & TY for the game show funnies!! The NEXT doctor I saw did a fancy thing called an “xray” and saw so much damage I got an order for an MRI and a referral to pain management. So glad I went for door #2! A “friend” told me her sister has cured her RA with special juice. Brandy, I AM vegan and was when I was diagnosed with RA! As I’ve mentioned in comments previously, I have since been told (by proponents of the “diet cures all” crowd) that I must have a wrong diagnosis or, alternately, that I might just be cheating and not really be vegan! I’ve been told by others that it’s because I’m vegan that I have RA! While I believe that my diet does help me manage my health with a family history that shows me to be at high risk for a cardiovascular event, it obviously isn’t going to cure my RA. I hate taking medication and managed my blood pressure and cholesterol by diet alone before RA, but you can bet I am glad when my Enbrel day rolls around once a week, and I faithfully take my Plaquenil each night! Loads. But I never think of them until 30min after the encounter with the idiots. During the encounter, I’m too busy being flabbergasted that people would actually say such nonsense to come up with a clever answer. It’s very frustrating. One of my “favourites” is going down the sidewalk on my way to lunch with a friend or to do some shopping and have people leap out of the crowd and tell me they’ll pray for me. It’s infuriating. They assume that just because I use a wheelchair, my life needs praying over. The poor cripple can’t possibly be having a lovely day, because – and this is one of my other favorites – they’ll earnestly tell me if they lost their ability to walk, they’d kill themselves. Because not being able to walk is apparently the worst thing that can happen. I was having a good day before they imposed their preconceptions of inability and pity on me. Afterwards? Not so much. Yes, the cleverness and sarcasm always comes later. Probably for the best because I’d have to exercise self control to hold it back… Same as you, I’m just flabbergasted. This was a dr., a nurse, and a relative. All people that I need to ‘get it.’ Maybe one day. Oh, oh, I can so feel for how you feel. The slightly lifted eyebrow and the bland expression as someone who has never, ever, walked in your shoes (because no-one CAN, eh, we all walk our own walk) says that they “know” someone who can do this that and sideways, therefore ?? ?, the implication is that WE are not trying enough. I said nothing, totally astonished that she would think that my having powered wheels was better than being able to walk. Totally dumbfounded by the remark. No-one else in the lift said anything either, and I am still crying about that careless, foolish, insensitive remark. Linnie – that’s a stunningly studid remark isn’t it? I think I’ve heard something similar about having pain meds- stupid is the only thing I can think of – I wonder if the woman ever realized what she said to you. Linnie, that was rude and insensitive, but I am also sure she just has never been around anyone who simply can’t do what she does, no matter how much we wish we could. Next time maybe you can smile and say something like, “I know. My power wheels are great and get me where I need to go. If I had a choice though, I’d choose to walk like you, like I used to be able to do.” Maybe then, she’d stop and think for a moment what it is to have no choice and to lose a vital skill, instead of just about how her job makes her tired. Don’t cry any more… because you deserve to be happy and respected! Never be afraid to say the truth. As Forrest Gump said: “Stupid is as Stupid does.” And THAT person was STUPID!!! OOPS! “That person” referred to the woman in the elevator, not to Forrest Gump!Sorry! My tongue (and fingies) get tangled some days! I started my battle with RA about 4 years ago. Just getting out of bed in the morning was almost more challenging than I could handle at that time. The pain, the fatigue, the fever, the feeling of your whole body being inflamed was part of every day. I am appalled at what I am reading in the above comments about the insensitiviy of others. As a nurse, I knew all about RA (or had intellectual knowledge, anyway). I knew about the drugs, the pain, the disfigurement, but I had no idea about the fatigue and the weakness. I learned each day about how the pain wears you out. I could see the pain reflected in the eyes of my husband and daughter; their sense of powerlessness when they couldn’t do anything to help. RA is a ruthless, horrible disease. I just discovered your website. Please keep up the good work. Thank you for giving those who suffer with RA a voice. Welcome Susan. Ruthless is a good word – I often say harsh, but I like your word better. I enjoyed your story about prince Erik. You do have a way with words. Thanks, Mary. I think the comments here are some of the best we’ve had. You know what we need Kelly? We need an “RA Awareness Card.” Something small and purse-sized with nice graphics, that is short and to the point for the short attention spans of most of the people who make these kind of ignorant comments. The card could give the basics facts about RA and address common myths,and conclude with the URLs of authoritative web sites. Then when someone says something stupid we can whip it out and say, “I can tell you don’t don’t much out RA, here is some information for you.” No muss, no fuss, no wasted breath, and maybe, just maybe, they will learn a thing or two about the reality of life with RA. I’m on it JoAnn!! Great minds think alike!! Going to combine your your ideas and mine and get this done asap!! DOesn’t everyone have RA? Some get it younger but everyone either has it or will get it. At least that is what people said whenever I mentioned I have RA. I don’t mention it anymore. Hi Denise, that’s similar to “Oh I know. Me too.” I hear that one too. There’s a lot of confusion out there about what RA is.. and isn’t. Ha! Thanks for taking the comments that can be so frustrating, and turning them into a laugh! OMG!!! I got that from my friend’s 75 year old mother-in-law when I was leaving physical therapy. She said, “Oh, you’re just way too young to have REAL arthritis pain, but how smart of you to have insurance pay for your ‘gym membership’ “….Yep! “I have a little of that in my finger…look” UUGGHHH!!! I always get that reply as well, oh I get stiff fingers etc…. Why do people do that I really get tired of hearing that! There are a lot of people that really don’t understand RA. Until you live it! Wanting to wish you all a happy and comfortable New Year and THANK YOU Kelly for this wonderful website and source of information, comfort and support. ‘WHAT A PITY THAT THE PEOPLE WITH CLOSED MINDS DON’T HAVE MOUTHS TO MATCH!! says it all doesn’t it Louise? Thanks for your very kind words! Happy new year to you! I am new here and have only been “officially” diagnosed with RA within the past month. I luckily have found a doctor who I absolutely adore. When my bloodwork didn’t fit the perfect profile she ignored it and went with my symptoms and tried me on some meds and when I responded she let that be her guide. When I one day told her I felt like I was being whiney and lazy she corrected me and said she had no doubt that something was wrong because no one would want to live like this. Those words meant so much to me that I was almost able to ignore my husbands words weeks later. We had gone to Vegas and I was having a “better” week (the methotrexate had started working at least a little), which mostly means I had days where I didn’t feel like someone was sticking a knife in my hip and back though I still ached. My lovely hubbie then noted that he’s not surprised I felt better because it’s always easier to feel better when you are doing something enjoyable vs. working or trying to take care of the house. I just looked at him and realized as much as he tries to be empathetic he really had no clue. Thanks for sharing that example, providing insight to what we need: people to listen & understand what we tell them RA is like for us. Since it CANT BE SEEN. Good luck with treatment & your wonderful dr! Linda, I think there are quite a number of us out here that owe Kelly a truck load of thanks for all that she does. I know I can look to her and this website when I need a good laugh, information about a medication, or just someone who gets it! First off, I want to say that this website is a godsend for me. It has helped more in my struggles with RA than you will ever know, and I cannot thank you enough. Second, last night I spent hours with a friend talking about my RA, because she doesn’t like it when I’m in a bad mood because of my RA. And I do agree, that when I’m hanging with my friends, I need to do my best to be happy and in the moment. But the part that got to me, is that she told me that I needed to be “less all about the RA”, that the RA did not encompass my whole life, and I needed to not think about it so much. I replied to her that everything I do is affected by my RA. It’s not a choice. She just didn’t get it. I finally asked her if when she had a 3 year old child, did she take that child into consideration when she did things. She replied – Of Course! I tried to explain to her that my RA is the same way. I cannot do ANYTHING without taking my RA into consideration, in the same way that a mother cannot do ANYTHING without taking her child into consideration. She still didn’t get it. She decided to tell me that she was sick some days too and spent the day in bed. When I told her I feel like that every day, but still get out of bed, she just looked at me like I was being over dramatic. It’s very frustrating sometimes. I hope your knees feel better soon or the meds work. Hi all…I must say as a newly diagnosed Ra’er this site is a blessing! The cruelest thing done to me so far was me walking into a room with a close friend that decided to tell the room full of people “hey this is my friend she has RA” everyone went into discussion about it after the lady of the house said “oh that’s that disease that cripples you and puts you in a wheelchair. Girl you’re gonna be folded up!” Is that your final answer? Sad to say she’s now battling chemo and radiation treatments. I now know that God has the final answer. Nice to meet you Sisera. I agree that God has the answer and often is himself the answer. Just got back from Orlando. I was berated by my mother in law for not taking my daughter to one to those giant parks. I have only had RA for a year and treatment has been a failing venture. Am on Humira now but does’t seem to be working. Prednisone keeps me going but not far!! I am stared at in public because it is so hard for me to walk. Thanks for this site. Has really helped my feelings of loneliness. Wish I had some of these great answers for the people who have such nice things to say!!! I’m sorry that the treatment has left you still in this situation. I’m with you. Your MIL must not understand how hard it is for you – she can’t see it. Hopefully she’ll learn more & realize her support would be much better than criticism. Just wanted to say thanks for this wonderful blog! I was diagnosed with JRA at age 2 and am now 27 so it’s been a lifelong battle for me. I have experienced the full gamut of ignorant comments from random strangers, and even from medical professionals who should absolutely know better. I feel like my tolerance for stupid comments like the ones described in your post is getting less and less. I wonder why DO we hold back the sarcastic (but true) replies? I am starting to think replies like yours are what some people need to hear. Anyway, your posts are ringing very true. Thank you for writing this blog and sharing your stories. I know what you mean–it’s hard to know whether these statements are made benevolently or whether someone is implying we should be able to do more. Are they just talking to hear themselves talk–just like if someone has MS or is paralyzed, they immediately bring up everyone else they know with the same condition? Sometimes I’ll let people know how what they say comes across–as in, “Maybe this isn’t what you intend, but what you’re saying sounds like you think I am not trying hard enough, etc.” Then the person has the opportunity to back down (and think!) if they’re just blabbering or they can clarify that they’re being a jerk and I have a bit of an opportunity to (attempt to) educate. But sometimes I’m not up to it. Recently when my husband’s relative said RA couldn’t have been the cause of severe medical complications someone had, I said, “No, arthritis like that is systemic–it affects all organ systems. It kills people.” Mine’s not RA, but it’s affected me systemically. They think it’s mere orthopedic pain, like osteoarthritis. Nothing I say can convince them otherwise. That was how I felt in the beginning. Now I actually respond and not keep things unspoken. Some people get offended but I’ve reached the point where I don’t care. Especially when it’s from doctors. I actually told one where he could shove his ignorant statement. Personally I would like a pamphlet to hand out to explain myself.. no it isn’t just a little arthritis,mine is more severe, there are several different kinds of arthritis all with varying levels of severity from mild to moderate to severe, yes I have tried vitamins, tylenol, exercise, physical therapy, shots, etc, lol lol I hate when people say oh I have that too and I just take some tylenol –I wanna say wow who knew tylenol was such a miracle that it alone could make you pain free and allow you to walk normal again, and all this time I have been getting iv treatment at the hospital and I could of just taken a tylenol— do you think the company knows? When friends and family ask me how I am doing with the RA……typical question, “Are you having pain?” I know they mean well. My response is, “You can assume I am always in pain, unless otherwise stated.” And it’s not just the pain, for some reason most think that it is JUST some pain. It’s all the other “wear me down” symptoms that go with it. I can relate! I don’t respond to anyone who doesn’t get it or thinks that because so-and-so has/had RA did such-and-such, thatfixed it’s the same for everyone with RA. It’s really annoying, but it’s not with it to me to argue with them. When they assume something or judge me, etc., I write their name on my mental People Who Don’t Know Crap list so I can avoid having another pointless and one-sided RA conversion with them. The worst part for me is that it’s the doctors who don’t hear me when I say, “I tried to bike for exercise like we talked about, but I discovered that it hurts my spine. I’m running out of things I can do… and I’m also worried about causing damage by pushing through the pain. What type of exercise is safe for my joints?” They never answer me and I feel like I’m just talking to the wind. I can’t trust that a doctor who doesn’t communicate is really treating me and not just the disease. I can’t help that my liver enzymes quadrupled in 2 weeks of MTX and the next drug made me tired and brainless. But I’m not going to start a new drug under the doctor who says that I just don’t know how good the last drug really did make me feel, but I’m going to find out when I stop taking it. Yes, he really said that… last April. After which I stopped taking anything… and felt better… and got my brain back. I actually felt pretty good from last April through new years. Been in pain since January, but don’t know of any more doctors who treat RA. I’m sick of driving all over for the other doctors I see. But yeah, when it gets bad enough, I’ll have to do something. Thank you Kelly for all that you do and say. I’ve lived with RA for 18 years. I’ve tried every drug on the market, and live a reasonably good life. I can totally relate to your experiences. I fought getting a handicap placard for years, because I didn’t want to be disabled. To look at me you’d never know how bad my arthritis is, how many surgeries I’ve had on my feet to correct issues stemming from arthritis. So when I park in the handicapped parking space it’s very possible that I’ll look pretty normal when walking from my car into that huge shopping mall. But when I walk out it’s a whole different story. I’m in pain, and hobbling. I’ve had people make rude comments to me when I’m walking into the mall. I do not hold back in my response, because after the first couple of nasty comments I found my voice. I look them straight in the eye and tell them they are not qualified to judge me, or make decisions about my health. Only myself and my doctor can do that. If they have any questions I’d be happy to share my doctor’s information with them. Please don’t keep your comments to yourself. Use your voice and see it as an opportunity to educate the ignorant. How will they ever learn otherwise? And…if they don’t believe you’re doing the best you can, who cares? You know the truth of the matter. Regarding the inadequate dr., I don’t see the point in complaining after the fact about the experience when nothing was said during the experience. If there is a fever, why not bring it up then about taking the temperature? Or ask why with an inflammatory condition haven’t joints been examined? Either bring up the issues to the dr. or don’t bemoan the experience afterwards. Complaining afterwards when not saying anything at the time is unproductive and simply makes no sense. Praise God! Finally someone who understands what I am thinking. Thanks. I have tears streaming down my face as I post this. You have reached into my soul and put my feelings and frustrations into words. God Bless you for sharing and letting others know they are not alone. I am very new to this RA thing. What I have found is people either treat you with kid gloves or like you are a lazy oaf. There seems to be no inbetween. I want my life back. I am scared of all the meds they have me on, however they do help the pain subside…still, I am left with barely enough energy for my basic hygiene. Take away my energy and I am no longer living, but merely existing. Is there hope? I am completely at a loss. I have always been a fighter, but how can you fight when you don’t have the energy to lift your head? I have a lot to learn. It appears I have found a wonderful source here in your blog. Thank you! 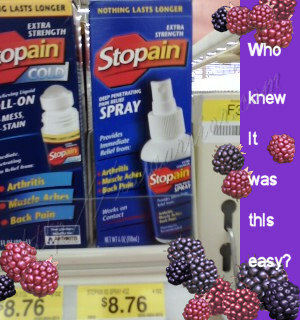 Yesterdays classic comment – my boss asked me AGAIN what I had and then asked me if I knew it was painful!!!!!!!! All I could say was, “yes, I know” Not what I needed when I was trying to explain I can’t cope with five days a week at work any more. I really like the idea of an info card, I feel like I’m complaining if I feel someone how I REALLY feel, so I just say nothing or “I’m OK”. Handing someone a card is definitely no muss, no fuss. Kelly, these constant innuendos and lack of compassion shown by medical personnel, friends and perhaps even family must be as frustrating and painful to RA patients as the illness itself is! Could these questions and unspoken answers somehow be put into a presentation at one of the rheumatology conferences you attend? If at least physicians at a conference could “hear” your pain via these questions and your answers, then perhaps they would try to initiate a bit more concern and compassion for RA patients who have to endure this ignorance of the RA disease’s many components. I hate that all of you, including my granddaughter, have to undergo both the disease and the lack of awareness of the constant discomfort you experience! Wish I could give all of you a “group hug”–except I know that it would have to be a gentle hug….I’ll just think the “hug” part instead….deep sigh……! I think I need to stop wondering if you are in my head. And start realizing that you write what many of us experience. It is sad to say that something so debilitating can be so disrespected and disregarded. I fight like hell everyday to not let this disease get the best of me. I am not lazy. And I would love if the stupid things people say were that simple to cure RA. Thank you~again. I have a little saying that is my mantra when dealing with ignorant statements about RD and the people who make these statements. I repeat ( under my breath ) ” God Bless Your Stupid Head”. I know I will lose it someday and yell it out loud but, I am becoming okay with that. Thank-you Kelly and everyone who contributes to this site. I am much more informed and feel less alone since finding you. The exercise bit kills me, too. I became ill right around the time I ran my first marathon- I don’t think it was from a lack of activity. And it’s tough to explain to folks that being physically active is a thing I miss dearly and that I do run/swim/etc as much as I can but sometimes it is quite literally impossible. I have had RA for the past 6 years and have had PMR for the past 2 years. I have been on several Meds. And they seem to work( some longer than others, some not at all) and I feel like such a failure because my body is not responding to anything except the Prednisone I take for the PMR and the injections or infusions temporarily. I am actually getting worse since I last had a reaction to the ladt infusion and am on zip right now. I I am seriously thinking about going back in Enbrel as I got 5 days a week if relief out if it before it wore off. My doctor seems to be losing interest in me as he us either not going over my chart or not paying attention to what I am saying. I am so swollen that if I got out if the house (with my super Nitro walker!) or ride in a car for about an hour, I my feel, ankles, legs and knees swell almost twice the size and the pain is horrendously mire than usual! I an in bed the entire next day as I cannot move and my limit of pain meds can’t touch it. I don’t know what to do !! But I am sooooo thankful I found this sight….you and all the other people who have RA have helped me feel not alone anymore. The only one who gets it -Thank God-is my husband!! Keep up the sharing it’s great!! Please pardon my spelling. My glasses broke and I have a hard time til next week check spelling. Next week new ones….. It always amazes me. You hardly ever meet the person of whom they speak with such intiment information on their health. But mostly their full of buska. yeah, I think they may not necessarily be right about what the “other” person is going through either, privately. I play this game every day and go to bed so tired I can’t even get my Jammie’s on! Thanks! I get so tired of people acting like they know what is going on in my body. On good days I can still do many things but please understand that doesn’t mean I can do those things all the time! Lots of people with rheumatoid disease are like you Jackie – different on different days. So people need to learn that about the disease (instead of doubt us).